Yes, you read it right, 3.6Ghz out of a 3000+ venice! I don't know how recently this screenshot was taken but from the image files URL, i guessing sometime in september. So there we have it, 3.6 out of a 3000+! That doesn't look real. I don't think that's possible even with nitrogen. Notice how there's no voltage I might be a little more convinced if it was CPU-Z verified. Even if it was acheived it was probably incredibly unstable. http://valid.x86-secret.com/ in the CPU-Z ID box, enter 35916, it was validated in august 05.
yeah, 400 x 9. When i get my 3000+, i'm only going for 2.6 minimum or 3.0 max but someone getting 3.6! There are a few of these around on the net, different people, some are slightly higher than this, not by muhc but still slightly higher. What's the the best/most stable HTT for a 3000+ though? And multiplier? I'd aim a little lower, with a 9x multiplier you are more likely to get between 2500mhz and 2800mhz and thats if you have a nice stable psu and a motherboard capable of >300htt. Mine is happiest at about 2450mhz(at stock voltage) with a maximum of 2750mhz but that is only stable at 1.65v which is rather too high for my liking. I only have mine at 2045Mhz but that is with the normal HSF and it hits about 34 degrees C.
If I get a new HSF I will probably push it much harder. Well in that case, since i'm gonna be getting a DFI NF4 Ultra D, i think that i'll go for 1.6V with 260HTT with 10multi. I've got a tect file about how to overclock the best way somewhere, i'll see if i can find it. Set the LDT multiplyer to 2.5 x or 3 x. Set RAM Ratio to 100MHz. Overclock the HTT by 10 - 15MHz. Boot into windows and run SuperPi at 32M calculations. If it's stable, up the HTT by another 10-15MHz. Run SuperPi at 32M (again). Repeat until SuperPi gives an error then back HTT down in 2MHz increments until stable. Run OCCT for 30Mins (not torture test). Back down HTT in 2MHz increments until OCCT passes. Run 3DMark'01, '02 and '05 and if they fail, back MHz down in 2MHz increments. Run Prime95 for at least 8 hours. If it fails, back off HTT in 2MHz increments until it passes. THE HTT YOU HAVE NOW IS YOUR CPU MAX! I'd do close to what it says there but I'd skip straight to setting the HTT clock to 300 and set the ram to 133, chances are it will work and save you an hour or so going through the motions of testing clock speeds you know will work. If the ram doesn't manage this then it's probably not worth going any higher and loosing memory bandwidth for the sake of cpu clock speed. Go into your bios. Go into the advanced chipset features(or something to this effect) menu. find where you can adjust the ram frequency(HTT/LDT maybe). Change the frequency to another number(CPU speed = HTTxMultiplier). Once you've got this changed, reboot. If it boots, bam you got an overclock. This is how its done, but not the proper methodology. Ideally you will want to eventually find out your max CPU frequency, max ram frequency, ram timings and what kinds of voltages you can add to the cpu to get gains, before you're just making more heat and instability. Ram speed- Timings will limit your rams frequency, but they are also important to a degree. To find the max frequency drop the multiplier on the CPU to eliminate the CPU as the cause of instability. Then make sure the divider(from above) is 200 or 1:1. This will lock the ram to the same speed as the HTT. Crank it up as far as it will go while still stable(testing after 5mhz or so). Add more voltage if you want(same thing goes for CPU if temps aren't too bad add more voltage). GPU works about like the CPU/RAM, just bump the GPU the same as the CPU, test every 5 mhz or so on the core, then lower the GPU and raise the ram. Do both until you get artifacts(white dots "snow"/broken glass like fragments). If you get them, drop the clocks back 5-10mhz and try again. Then try to balence these max numbers. Overclocking CPU: Go to BIOS. Athlon 64's have locked multipliers. And a HTT of 200mhz. 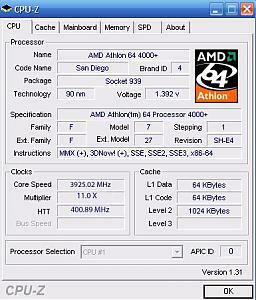 The 3500+ has a multiplier of 11 and a clock speed of 2200mhz. This is achieved by multiplier*HTT. 11*200=2200mhz. NOTE: Your RAM should allow for a great deal of overclocking. To start with increase the HTT in increments of 10mhz. Reboot run stability. Prime95 is favoured, but I dont like it, I prefer SuperPI. You can get both from www.aoafiles.com . When there is instability in these tests, in BIOS increase the vCore (CPU voltage) to about 1.6v. And see if this improves stability. If not, try increasing the vDimm (RAM voltage) by the smallest ammount. If this doesnt work, lower the vDimm to stock again, and loosen the timings from 2-2-2-5 to 2.5-3-3-6. If this also fails, reset the timings, to 2-2-2-5, and set the RAM divider to 166mhz. (THIS IS SHOULDNT BE NEEDED ON HIGH QUALITY RAM!) If all this fails, reset RAM divider to 200mhz (stock) and lower the HTT by 5mhz increments until stability is restored. Overclocking GPU: A HIGHER CORE CLOCK IS BETTER THAN A HIGH MEMORY CLOCK. Get ATi Tool. And click "Find max core" when it finds it, (it may take a while), write it down somewhere, then put it back to stock, and repeat with "Find max memory". Once found put both max core and max memory clocks on by moving the sliders and click set clock. If it artefacts, reload the default speeds, and reboot computer. Repeat the process of GPU overclocking EXCEPT when setting the mem clock, set it 15mhz lower than the max. If this is stable, increase by 5mhz. Until artefacts occur. When max clock is found, save the profile. Set it to start your overclocked profile upon booting. And your done. Further GPU tweaking can be done by lowering the memory latencies of the RAM which are all found under the "Memory" button. Lower latencies by one at a time. Because if you go even 1 latency lower on the wrong setting causes MASSIVE artifacts and could potentially turn your high-end graphics card into a $900 paper-weight. Although I did, I dont recommend overclocking on a stock cooler. Thermaltake air coolers, or water coolers are best for overclocking unles you wish to buy a $1200 VapourChill case. Note that the last one wasn't written than me but the first shorter one was. Last edited by skool h8r; 2nd January, 2006 at 05:08 PM. ah right, so 9 max. so i'll set it to 290 then with 9 multi at 2.6volts. That should take me just over 2.6. I get 2.6GHz stable witha 3500+. Mine isnt very happy over 2.5ghz, I have to put a lot of voltage into it and my mobo is not good over about 285htt although this is likely my cheapo memory. Oh yeah, 1.6Volts, not 2.6. But i bet the best boards for OC'ing an A64 are Asus or DFI. Thanks for the post SH!! the best boards for OC'ing an A64 are Asus or DFI. EDIT: I'm going to try OC my 4000+ lets see how high it will go. Last edited by madcatmk3; 2nd January, 2006 at 06:40 PM. You have a DFI, not an EpOx, And I thought you already tried overclocking? Yes, that's the difference, it's validated. thing is, it's now very hard to fake CPU-Z scores that are verified because of checksums which i belive would need a rainbow table to fake them as the appear to be MD5 or 128bit encryption.